When we hear the word ‘market’ the first thing which comes to the mind would be an air-conditioned supermarket or a crowded street market. One of the two would definitely pop up as soon as we hear ‘market’. Chatuchak market is the most prominent market in Thailand for the types that came into your mind after hearing ‘Market’. However, there is one more interesting facet to Thailand’s market. It is the Floating market. The most interesting of such market of Thailand is in Bangkok. Travelers who visit Thailand should always visit this place to shop and more importantly have an insight about the ways of life of locals who live along the banks. 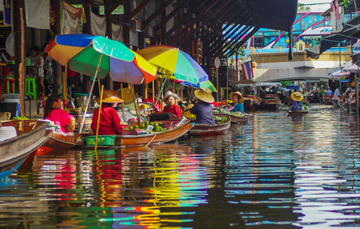 There are many vivacious markets that float over canals in Thailand but the oldest and largest of them all is the one in Bangkok. If we talk exclusively about the place, then Bangkok's floating market called the Damnoen Saduak floating market is the best place in Thailand to shop and experience something unique. The best vistas one can capture in this market with friendly people selling vibrant stuffs including fruits and vegetables on the open water canals. The trinket shops are everywhere in the market selling interesting things. These markets of the banks are not only good for shopping intriguing stuffs but are also an appealing place to be in. The vistas of the merchants selling goods from their boats look just amazing. The residential area of the canals is all the more beautiful. The coconut grooves swaying at the periphery of the markets provides a more serene charm to the place. While exploring the market do not forget to visit a beautiful temple which gets hidden by the boats on the canal. There only a few tourists to the floating market who ever get to see this temple. So do keep this thing in mind while exploring and have an enchanting site to behold in this busy floating market. 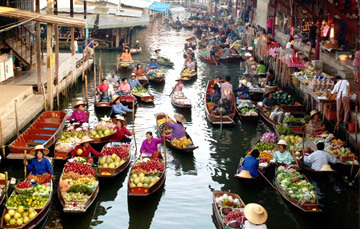 Travelers have a lot of variety if they want to explore the authentic floating market in Thailand. There are plenty of such traditional Thai floating markets. On the banks of the Chao Phraya River, Taling Chan floating market is set every weekend for shopping enthusiasts and tourists that came from all over the world to visit the markets. The market starts from 09:00 and winds up at 16:00. Another market is the Tha Kha and Ku Wian which is located in Bang Kruai and can be easily accessible from bus.